Often I am called in to review a design or a concept from a client, in person or at a distance. 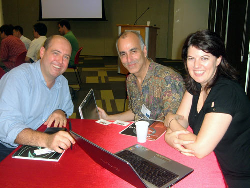 The picture at the left is from Xmedialab in Singapore, Dec 2006, a special workshop organized by Brendan Harkin where experts meet with several project teams. Typically however the sequence is that I am contacted by a potential client, we discuss the basic idea (I will sign standard Non-Disclosure Agreements first), and I review their printed information and drawings. Then I write a report detailing my impressions and listing the challenges their design is likely to face, and we discuss it. Rates vary depending on the depth of the materials and the report, but this is typically a quick, inexpensive "test the waters" way to collaborate. Sometimes a project is farther along, with a prototype of hardware or a licensed character or other IP, but with limited gameplay ideas. I can suggest appropriate game genres and gameplay conventions.